In most cases, when a book that deals with potentially classified military information is due to be published, one of the United States's many government divisions inspect it, redact sensitive parts, and either let publication continue or stop it entirely. But a clash in opinion between the U.S. Army and the Defense Intelligence Agency may lead to the DIA buying up all 10,000 copies of the new memoir's first printing -- and promptly pulping the books. 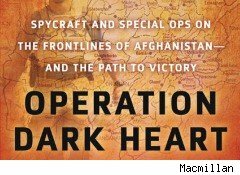 As the New York Times reported today, the dispute centers around Operation Dark Heart, a memoir of five months spent as a soldier in Afghanistan in 2003 by Anthony Shaffer, a former DIA intelligence officer and lieutenant colonel in the Army Reserve. The book was originally on track for an August 31 release by Thomas Dunne Books, part of the St. Martin's Press imprint of Macmillan. In January the Army had made its customary suggestions and redactions and greenlit the book, saying the branch had "no objection on legal or operational security grounds." The same could not be said for the DIA, after it received a copy of Shaffer's manuscript in July. In the DIA's review, in conjunction with other intelligence divisions, they identified more than 200 passages suspected of containing classified information, much of it dealing with a pre-9/11 data mining project called "Operation Able Danger." Then, in an August 6 memorandum, DIA director Lt. Gen. Ronald L. Burgess Jr. wrote that the release of Operation Dark Heart "could reasonably be expected to cause serious damage to national security," because of the book's claims that "Able Danger" successfully identified hijacker Mohammed Atta as a threat to the United States before 9/11. Now the DIA is in a bit of a bind. They plan on buying up the entire opening print run of Shaffer's book, which has been pushed back to a September 24 release, pending an agreement between St. Martin's and the Pentagon about what classified information needs to be blacked out. But several dozen copies of the original edition have already been sent to publications for review consideration (the New York Times bought its copy online). With information about the book emerging, the idea that the Pentagon can put a very expensive lid on the proverbial Pandora's Box seems short-sighted at best and ludicrous at worst. Indeed, the very opposite effect seems to be taking place. "I admit I was unfamiliar with Operation Dark Heart," said Mother Jones' Daniel Schulman, "But now I can't wait to get my hands on a copy...mostly because the Pentagon does want me (or you) to." Shaffer's book is temporarily out of stock at Amazon (AMZN), because of the Pentagon's plans for the original print run, so the books are now sitting in a warehouse in Virginia. That means that as of 2 PM today Operation Dark Heart was ranked No. 4 among books sold by the online retailer. It could end up being the most unlikely bestseller of the year.